For the December edition of the GFDD Global Roundtables, GFDD Executive Director Natasha Despotovic talked with Margaret Myers, Program Director of the China and Latin America at the Inter-American Dialogue, a reputed D.C.-based think tank. The session focused on the work of the organization analyzing the trade relations between China and the Latin American Caribbean (LAC) region, looking in particular at the impact of recent political and economic development within the two regions. The Dominican Film Showcases in Washington, D.C. and New York could not have had better turnouts. The film shown in New York was Código Paz by Pedro Urrutia, and included a special appearance by one of the actors in the film, Héctor Aníbal, for a Q & A session after the film. Código Paz and Pedro Urrita made an appearance at the Washington D.C. DFS as well, along with the films Los Paracaidistas, directed by Archie López, and Yo Soy la Salsa, directed by Manuel Villalona and produced by Andrés Van der Horst. Special guest Cheddy García, the award-winning actress, was present for the showing of Los Paracaidistas. Each film showing brought about lively questions and discussion. The showing of Yo Soy la Salsa was such a success, an additional screening was provided at the Embassy of the Dominican Republic in Washington, D.C. in December. Babson College Dominican students hosted five college students from the Dominican Republic on their campus as part of the Global Dominican Academic Exchange program, from November 2-8, 2015. Activities for the week included campus tours of Babson College and Harvard University, along with tours of historic sites of downtown Boston, museum visits, and basketball games. During the day students had the opportunity to attend business classes with their hosts, selecting the courses based on their majors and personal interests. GFDD Fellow Yuan Li gave a special presentation of her research findings at Funglode headquarters in Santo Domingo on December 11th. The presentation was followed by a panel discussion with the Fellow and international policy experts, Franklin Lithgow, Foreign Direct Investment and Business Development Consultant; Rosa Ng, Representative of the Commercial Development Office of the Dominican Republic in Beijing; and Miguel Sang Ben, Economist and Professor at the Pontificia Universidad Madre y Maestra (PUCMM) in Santo Domingo. The 2015 DREFF Recap Magazine is ready online! Visit our website to download your copy today. 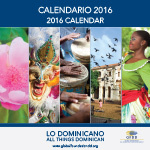 GFDD´s 2016 Calendar is ready! Venue: ITSC, Dirección: Carretera Mella KM. 14 Esquina. Francisco Del Rosario Sánchez, San Luis Distrito Municipal, Santo Domingo Este, República Dominicana. The screening is free and open to all students. Inspired by the films screened during the 4th and 5th Dominican Republic Environmental Film Festival (DREFF) at Villa Serena Hotel in Las Galeras, Samaná, a group of young people have decided to raise awareness on the importance of sharks for preserving biodiversity through a new softball team: the Las Galeras Sharks. With the creation of the Ramón Antonio Rodríguez Bueno family farm at La Zurza, in Santo Domingo, EcoHuertos wraps up its work for the year 2015, and begins the projects planned for 2016. The Rodríguez Bueno family now has their own small farm. This past December 9th, Ramón Antonio Rodríguez Bueno’s children, family members, neighbors, and members of FUNDSAZURZA and SODIZUR all participated with great joy in the creation of the Rodríguez family farm. This project was overseen by GFDD’s EcoHuertos Program.